January 9, 2014 by Ken Ward Jr. It seems that at least some of the beltway media are expecting some serious news to come out of a hearing this morning before the House Natural Resources Committee, where Republicans are continuing to try to manufacture some major Obama administration scandal out of the Office of Surface Mining Reclamation and Enforcement’s bungling of the Environmental Impact Statement for its rewrite of the stream buffer zone rule. The National Journal, for example, ran with the ridiculous headline, Explosions Coming Over Mountaintop-Mining Rule and a typical story reducing the matter — and all things related to mountaintop removal and coal mining — to the standard Democrats vs. Republicans story line. For those who have forgotten, this all goes back to the big scoop that Tim Huber wrote for The Associated Press in January 2011, about the potential job losses outlined in a leaked documents from the OSMRE EIS. … In the draft report, OSM outlines potential alternatives that range from doing nothing differently to banning all valley fills and prohibiting mine operators from obtaining variances to the general “approximate original contour,” or AOC, reclamation rule. The OSM “preferred alternative” would allow valley fills, but require mine operators to take steps to minimize the burial of streams. It would also place new restrictions on the use of AOC variances. Under this alternative, the study projects nationwide coal production would increase slightly, as western mining in Wyoming, Montana and North Dakota make up for reductions in Appalachia. Total direct Appalachian coal jobs would decline from nearly 23,000 to just more than 15,000, according to the draft study. At the same time, annual miles of streams buried by valley fills in Appalachia would drop from 71 to 57 miles. Annual acreage impacted by mining would drop from 33,000 to 26,000 in the region. What’s happened now is that back before Christmas, the Interior Department’s Inspector General released a report on its investigation of this whole situation with the EIS, focusing on “media reports” — they cite a Fox News website posting that alleged the Obama administration pressed EIS contractors to reduce the job loss estimates — about this whole thing. The IG report, available here, is certainly interesting reading, if a bit dense. Among other things, readers may find parts of it hard to follow, since the IG decided not to name many of the government officials it was investigating. On January 26, 2011, an OSM employee emailed Pizarchik’s counsel a link to the Associated Press article. The following day, the counsel emailed Pizarchik, stating: “We should fire the EIS contractor. And put that on the front page!!! !” Several hours later, she emailed a SOL assistant solicitor that OSM was considering its options for terminating OSM’s contract with PKS. She attached an “EIS options” document to the email, listing the pros and cons of continuing the contract, terminating the contract for convenience, or terminating the contract for cause. She noted that terminating the contract for convenience might look like retaliation. Not for nothing, but perhaps if the folks at OSMRE, including Pizarchik and his handlers, had been more open and transparent about what was going on after AP broke its story, they might not have ended up in this mess now. Go back and read this, to see how OSMRE officials — rather than actually answering questions about the matter — spent their time demanding that say-nothing prepared statements be given more prominent play in media accounts of the situation. Of course, West Virginia Sen. Joe Manchin can’t pass up a chance to pledge allegiance to the coal industry. So he’s gone along with a letter that demands the Interior Department abide by the OSM contractor’s original job-loss estimates. Now, part of what this is about, if you read the IG report, is whether the EIS would use as a baseline 2008 coal production without enforcement of the never-implemented 2008 Bush administration buffer zone rule changes or as if those change had been implemented by OSM. The thought underlying the whole discussion is that if you had assumed the 2008 changes were implemented, coal production and jobs would have declined and therefore additional job losses from the new OSMRE rule Obama’s team was working on would have appeared smaller. We interviewed the president of subcontractor Morgan Worldwide, who calculated the costs associated with the Stream Protection Rule and actually configured the baseline. He said he used 2008 coal production data as the baseline for his analysis, which included the 1983 rule, and then looked at current industry practices, including what was required for filling streams under the Clean Water Act. When asked about OSM’s directive that the 2008 rule should be applied as the baseline, he said the contractors were “very clear” that the 2008 rule could not be applied. Morgan Worldwide’s staff attorney, who was also present for the interview, stated that using the 2008 rule as the baseline would be difficult since the rule had never gone into effect due to litigation and there was no way to know how long the legal case would continue. Morgan Worldwide’s president and staff attorney stated that because of newer Clean Water Act requirements, mining operators were already expected to comply with the major aspects of the 2008 rule, so the baseline issue was a moot point. Another House hearing on all of this will make for good political theater. But it seems unlikely to do much to address the clear science that shows mountaintop removal is damaging the environment, and certainly not the growing science that shows residents living near this kind of surface mining face greater risks of illnesses and death. Then again, I’m guessing that Sen. Manchin wouldn’t sign a letter that demanded the Interior Department do anything about those issues. Thanks, this is very informative. It also needs to be noted that a OSMRE rule making has always bee a constant struggle since it began in 1977. U.S. District Court Judge Flannery’s decisions are reflective of those struggles. As Mr. Ward points out the IG report is certainly interesting. The quote from a top OSM attorney, “It’s not the real world. This is rulemaking.” says so much about the entire experience. I and the 100 or so scientists, engineers and economists who were part of the original EIS contract team feel a certain amount of vindication with the IG findings. I also feel that Ken Ward still owes Joe Zaluski and I and the rest of the team an apology for his characterization of us in his November 18, 2011 post, especially after this report. We testified at the hearing at that time only because OSM Director Joe Pizarchik had insulted the integrity of our entire team. I have copied my Statement responding to the IG report below because while there was vindication of our work on the EIS and documentation of the misconduct of certain OSM employees, I felt that there were also areas where the report could have gone further to set the record straight. In December, 2011, the Department of Interior, Inspector General’s office initiated an investigation of the Office of Surface Mining Reclamation and Enforcement (OSM) after news outlets reported in November that OSM pressured contractors working on an environmental impact statement (EIS) to lower their estimate of the number of potential job losses associated with a proposed rule to protect streams located near coal mines. OSM then allegedly ended their contract when they refused. 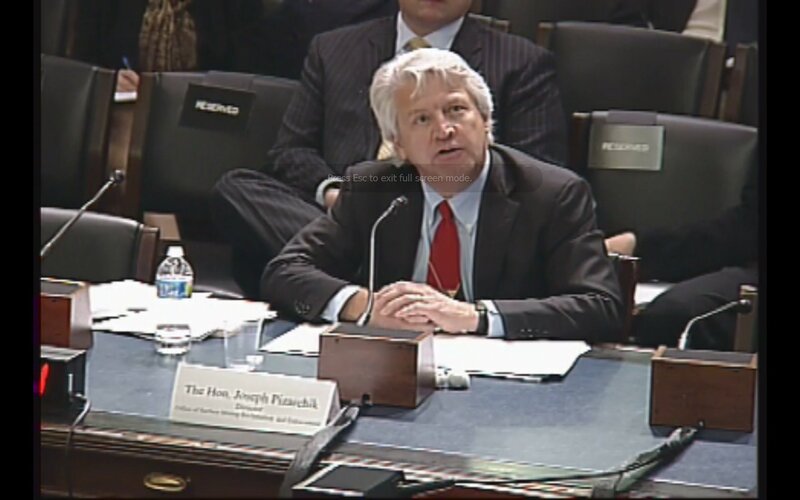 Joseph J. Zaluski, ECSI Executive Vice President and I had testified before the Committee on Natural Resources Subcommittee on Energy and Mineral Resources of the U.S. House of Representatives on November 15, 2011 which led in part to this IG investigation. I was prompted to testify after I had reviewed the testimony of Joseph G. Pizarchik, Director of OSM during the November 4, 2011, Subcommittee Hearing. As a licensed Professional Engineer I felt compelled to protect both my profession, my firm and my reputation and character by taking a position that would not allow the falsification, misleading or changing of report results to reflect a given and desired outcome. 1. Mr. Pizarchik made the statement that the job loss numbers were “placeholders” and were “fabricated.” As I have previously stated, the EIS team, which included OSM personnel, performed the analysis to the best of its ability given the deadline and budget. When OSM did not like the result of the analysis, OSM asked that the team change the baseline conditions and use alternative assumptions to alter the coal production and job loss numbers. 2. Plagiarism was alleged against the PKS team in drafting the EIS. Under NEPA, it is preferred that the drafters of an EIS utilize as much existing information as possible and not “reinvent the wheel.” While I cannot speak for the entire PKS team, ECSI utilized text from previous EIS documents, as directed by OSM, where appropriate and cited those documents in its references. In fact, ECSI posed the question to OSM personnel of whether we should simply cite previous EIS documents or if we should put the actual text in the SPR EIS. ECSI was directed by OSM to put the text in the SPR EIS rather than merely cite to another document for ease of the reader. 3. Despite Mr. Pizarchik’s claim that OSM was at “arms length” during the process, OSM personnel were intimately involved in the EIS throughout. 4. The OSM Project Manager said in meetings with recorded transcripts that the PKS team performed exactly as they had been instructed. ECSI personnel and the associated team members who were involved in the OSM Stream Protection Rule, Environmental Impact Statement project felt a certain vindication at the release of the Inspector General’s Report which validated the position that ECSI had taken to not alter results of a study. While the Inspector General’s Report did validate ECSI’s position, there were still several areas that were not adequately explained or where the Report could have gone further to set the record straight. For example, quotes in the Report from certain OSM employees stated that the work product was inferior did not take into account that much of that work product was also the work product from OSM employees who were imbedded in the work team. Also, many sections of the report were incomplete since adequate time had not been given to perform the study. This is backed up by the fact that OSM continued the work on the project with another team of consultants and even included one of the former team members who had indicated that they were willing to consider changing the underlying assumptions to come out with a different outcome. The EIS has yet to be released which confirms the fact that adequate time had not been provided by OSM for the first contract. The statements of OSM employees that work product was inferior did not take into account their own work and their own unachievable deadlines. Another point that was not adequately brought out in the IG report was the fact that OSM had told project teams not to worry about the deadlines since additional time would be given to adequately perform the EIS studies since they recognized the project schedule and deadlines were impossible. For example, one key problem was the fact that OSM waited months to inform the project team that underground mining would be included in the EIS. This surprised the team and many OSM employees when they released copy of the draft underground regulations in a team meeting. Sometime in 2009 I received a call from an OSM employee who asked if ECSI would be interested in being involved in drafting the Stream Protection Rule EIS that was going to be contracted out in the near future. One of ECSI’s core competencies is mining and in particular coal mining in the United States. He stated that the reason ECSI was being approached as a recommended subcontractor was our reputation with both the regulatory and regulated community. OSM intended the process to be a minority/small business set aside contract so that they could issue quickly. OSM was also recommending subcontractor teams to be ECSI, a national geotechnical firm, and Morgan Worldwide (a consulting firm recognized for their work in the environmental community such as the Sierra Club and advocacy attorneys suing mining companies and government agencies). In conversations with OSM personnel, it was our understanding that OSM had a preferred, minority business contractor who would contact ECSI. In due course, we received a call from Polu Kai Services (PKS) who was responding to an RFP issued by OSM to perform an Environmental Impact Statement on the Proposed Stream Protection Rule. PKS advised us that they were assembling a team of consultants to perform this complicated, nationwide programmatic EIS and that they were looking at our firm to be the mining experts on the team. They were also retaining MACTEC, a large national consulting group to perform geotechnical and environmental aspects, Morgan Worldwide to contribute their mining and environmental expertise to complement and balance our involvement, and Plexus Scientific for their NEPA experience, project management, logistics and final EIS drafting. ECSI assisted PKS in preparing the proposal and budget, and eventually a contract was issued to PKS. We assembled a team of experts in mining that included nationally recognized academic experts in mining, hydrology, and reclamation (some of whom are experts that OSM has utilized on a routine basis). ECSI was then subcontracted by Polu Kai Services (PKS) as subject matter experts to assist with the EIS for the Stream Protection Rule. The EIS project kicked off in June 2010 with a meeting in DC between PKS, the subcontractors and OSM’s team. During that meeting, we learned that OSM had two teams assembled. One was a rule writing team and the other an EIS team. An immediate issue that came up was the short timeframe within which OSM wanted the EIS prepared. PKS and the subcontractors voiced their collective concern that the accelerated timeframe was overly ambitious. OSM team members agreed and advised that there would likely be time extensions granted and budget increases to adequately prepare an EIS of this magnitude. The original date for delivery of the Draft EIS was February 2, 2011. The assignments were allocated and ECSI was charged with reviewing the concepts of the proposed rule and predict production impacts nationwide. A copy of the draft rule dated May 25, 2010 was provided to the PKS team at that time. •	OSM did not believe that public meetings were necessary, and that the Notice of Intent (NOI) and request for public input within the NOI, as published in the Federal Register, was adequate. Virtually everyone on the PKS team agreed that the NEPA process called for public meetings to be held so that affected communities could comment. The PKS team convinced OSM of the necessity of public meetings, which added approximately 4 months to the process. Public meetings (termed “open houses”) were held across the country. These meetings were poster sessions where the various alternatives for the rule were outlined and the public was given the opportunity to submit written comments or oral statements. •	It was unclear to the PKS team if the proposed rule applied to underground coal mining methods. That question was repeatedly posed to OSM, and several months into the project at a team meeting in Atlanta, the PKS team was informed that the decision had been made that the proposed rule would be applied to underground mining. This took both the PKS team and many of the OSM personnel present by surprise. The PKS team received a letter dated October 7, 2010 from OSM stating that it was disingenuous to suggest that the rule did not apply to underground mining. The PKS team felt that the last minute inclusion of underground mining impacts was a major change in scope and schedule to the EIS, and requested additional time and budget to properly evaluate the impacts. OSM denied this request and insisted that underground mining had been part of the original scope of work all along and that the contractors were well aware of this. This disagreement is well documented in the record. After this initial 4 month delay for scoping meetings, OSM began to embed its own engineering and science personnel in the various contractor EIS working groups, ostensibly to speed up the process. To determine impacts on coal production under the various Alternatives, including the proposed rule (termed the “Preferred Alternative”), ECSI planned an analysis of production impacts utilizing “typical mine” models of all mining methods from each coal producing region, and applying Alternatives to those mines to determine production impacts. However, that effort proved to be impossible within the prescribed schedule and budget. As an alternative to the “typical mine” analysis, an Expert Elicitation methodology was proposed and approved by OSM. That methodology and the major assumptions are described in detail within the Draft EIS at Section 4.0.6.1, as submitted by PKS on February 23, 2011. A subgroup was formed to perform the expert elicitation production impact analysis, which included members of ECSI, Morgan Worldwide, PKS, and OSM personnel. As an additional validation of the elicitation process, ECSI proposed that selected coal companies from each coal region be surveyed on what they believed the production impacts would be under each Alternative. OSM originally approved of this approach, but hours prior to sending the survey out, OSM withdrew its approval. Coal production impacts under each Alternative were forecast and the results were distributed to the rest of the PKS team, including the team members performing economic analyses. The production impact numbers were then utilized to predict job impacts nationwide. A joint PKS and OSM team meeting was held in February in OSM’s offices in DC. During this meeting, an OSM attorney “suggested” that the PKS team revisit the production impacts and associated job loss numbers with different assumptions that could then change the final outcome to show less of an impact. The EIS team unanimously told OSM that it was not appropriate and unprofessional to change assumptions just to get a different answer. The team was also very concerned with the specific instruction from OSM to make the assumption that the 2008 Stream Buffer Zone (SBZ) Rule was in effect and being enforced across the U.S., which was not true. No state with an approved SMCRA program had promulgated the 2008 SBZ Rule, especially since the rule itself was subject to the litigation which brought about the SPR. If the PKS team assumed that the 2008 SBZ was in effect as part of the baseline existing environment, the nexus from the SBZ to the SPR would show less production, and therefore less job loss impact. The PKS team unanimously refused to use a “fabricated” baseline scenario to soften the production loss numbers. •	that the production impacts/benefits should be tested by applying the alternative analysis to typical mines for each Region. It is important to note that Chapter 2 of the EIS is the description of all Alternatives, including the “Preferred Alternative,” upon which the entire EIS impacts analysis is based. Shortly after the February meeting with OSM in DC, the PKS team received a notice that the contract with PKS was not going to be renewed.